Ayurveda considers removing toxins and impurities from the physiology, and preventing their build-up in the tissues, to be a key part of staying healthy. Ayurveda refers to these toxins and impurities as “ama”. Because ama disrupts the delicate biochemistry in the tissues and blocks the channels of circulation and communication within the physiology, it is a contributing factor in many physical disorders. The build-up of ama often starts with poor digestion. A sluggish digestion creates toxins and poor elimination, which allows the toxins to be absorbed into the circulation system and transported throughout the body. Many of the recommendations given by Ayurveda experts during a consultation address the need for internal cleansing or detoxification. Of those that can be done at home, sipping hot water throughout the day is easy and effective. Hot water flowing through the digestive tract helps to dissolve impurities and cleanse the digestive and eliminative systems. The result is an improvement in digestion and assimilation of food, improved elimination, and prevention of the formation of ama. In addition, the hot water is absorbed into the circulatory system and travels throughout the entire body. The extra warmth and fluid aids in opening all the various channels of circulation, dissolving accumulated impurities and washing them from the body. Many people report that after just a few weeks of sipping hot water throughout the day, digestion and elimination has improved and they feel fresher, lighter and more energetic. Drinking hot water (water which just cool enough to be sipped comfortably) is especially helpful during vata and kapha season. During the hot summer months, warm or room-temperature water may be preferred, especially for those with pitta body types or with pitta-related disorders. 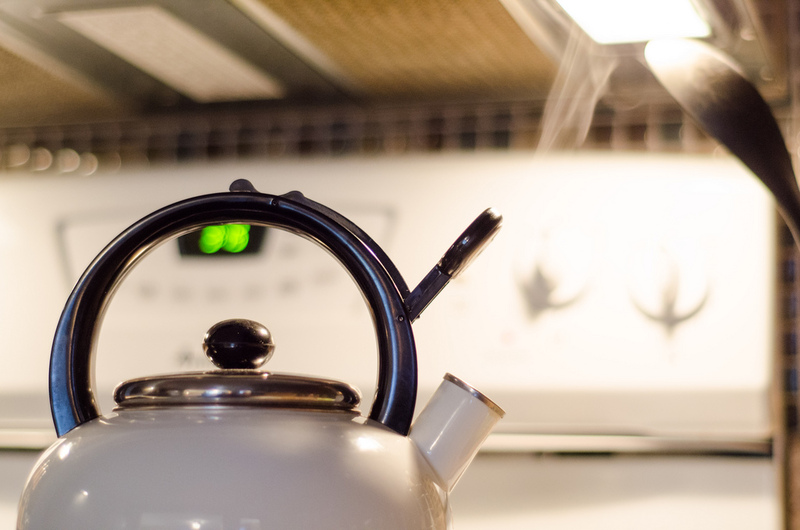 Ideally, Ayurveda recommends that water be boiled for ten minutes. Boiling the water allows excessive minerals deposits and impurities to precipitate out and increases the water’s lightness and its cleansing influence. A slice of fresh ginger root, a pinch of turmeric or a few fennel seeds may be added to the boiling water if desired. These herbs can help increase the cleansing influence of the water in your system. Lemon may be added if it is not upsetting to the stomach. This week we are reposting one of our most-read posts. Happy holidays from The Raj! If you are familiar with Ayurveda, you are familiar with the concept that everything in life — including our bodies, the food that we eat, and the environment around us — is composed of the three “doshas”; vata, pitta and kapha. These qualities, or principles of nature, each have their own fundamental traits. Vata, the principle of movement, is the ruling dosha for the late fall and winter seasons. These months are marked by the same qualities that characterize vata: coldness, dryness, lightness, and movement. During the winter many notice a tendency toward dryness, constipation, anxiety and insomnia — all imbalances that can take their toll on our skin. Luckily, through the understanding of Ayurvedic principles, we can take steps to pacify vata and keep our skin balanced and glowing throughout the winter months. At any time of the year it is important to be gentle when washing the face, as it is easy to aggravate vata, which can promote dryness and wrinkles. Favor body-temperature water over hot, hot water. Avoid using soaps with chemical additives. For most skin types, sweet almond oil is a good lubricant to use after washing to help protect the skin. Sweet almond oil is also healthy way to remove make-up before washing. A luxurious option for keeping skin lubricated in the winter is to bathe the face with milk. Whole, organic milk is ideal. The tiny, nutritious molecules of milk can be easily be absorbed by our skin without clogging the pores. Heat the milk to body temperature (not too hot) before applying. 1. Drink plenty of warm, pure water throughout the day to both purify the body and stay well hydrated. 2. Ideally, enjoy organic, freshly cooked meals, using healthy oils such as olive oil and ghee. Remember, you want to counter the influence of vata, which is characterized as light, dry and cold. Healthy oils in winter are our friends. 3. Eat your main meal at noon. 4. Avoid packaged, frozen, canned and processed foods, which are difficult to digest and often include harmful additives. 5. Favor vata-pacifying foods such as avocados, pumpkins, carrots, beets, asparagus, bananas, lemons, mangoes, peaches, quinoa, basmati rice, wheat, almonds, sesame seeds, boiled milk, and ghee. Nuts and seeds provide healthy oils that are good for skin and hair. Eat more foods with sweet, sour, and salty tastes and less of those with bitter, astringent, and pungent tastes. Don’t forget that Ayurveda recommends having some amounts of all six tastes with every meal. Otherwise the body can develop food cravings. Ayurvedic spice mixes or “churnas” can help you make sure that you get all six tastes. 6. Avoid dry, raw foods, especially salads and raw vegetables. 7. Use a humidifier at night, especially if you have forced air heating. 8. Before your morning bath, give yourself a gentle self-massage with sesame oil. Those who tend toward pitta imbalances may prefer sweet almond oil or olive oil or coconut oil. The oil helps to pull out toxins from the skin and also leaves a protective layer between your skin and the harsh winter environment. Don’t feel like you have to remove the oil with soap. Soap is essentially oil and fat combined with salt. A good scrub with a luffa or body brush after your morning oil massage is really all you need. 9. Go to bed early and try to get eight hours of sleep. As vata is the principle of movement, the most effective means of pacifying vata is to get enough sleep. 10. Learn to meditate. The Raj Ayurveda Health Center recommends the Transcendental Meditation program (TM) to complement their in-residence Ayurvedic treatment packages. An imbalance of vata can lead to an overactive mind, worry, anxiety and insomnia. Over 350 published research studies on the TM technique have documented a wide range of benefits, including reduced stress and anxiety, improved health and brain function, and increased self-actualization. For more information on vata-pacifying skin care products, herbal formulas to improve skin or digestion please contact the herb room at The Raj. Ideally a visit to an Ayurvedic expert in your area will help to more precisely determine which supplements, diet recommendations and life-style tips would benefit your individual mind/body make-up. According to Ayurveda, a large percentage of our health can be won or lost in how we live our day-to-day life. It is our patterns of eating, sleeping, exercise and what we do daily to rejuvenate ourselves that can determine whether we stay healthy throughout our lifetime. Ayurveda recognizes the importance of our relationship with the universe around us: if we live in accord with the laws of nature that structure our environment, we can keep our mind/body system functioning efficiently with the least amount of wear and tear. One key element in living in tune with our environment is when we go to bed and when we get up in the morning. There is a saying, “The day begins the night before.” Only by going to be early in the evening can the next day’s activity be fully in accord with the rhythms of nature. When we are in bed by 10 P.M. we gain the deepest level of healing and rejuvenation from our sleep. This is because during the 4 hours before 10 P.M., kapha dosha is increasing in nature. This enlivens the qualities of heaviness and dullness in our mind and body and allows us to fall asleep more quickly and to experience deeper, less interrupted sleep. After 10 P.M., pitta dosha starts to become enlivened. Pitta is involved in metabolic cleaning. The body needs to be inactive at this time so that the physiology can focus its intelligence and energy on metabolic cleansing and rejuvenation. When we stay up past 10 P.M., many people experience a “second wind”. Instead of being directed internally, pitta creates an increase in energy, creativity and, too often, hunger. This accounts for the infamous scourge of midnight snacking. While many busy adults feel that they are grabbing valuable “me” time in the late hours of the night, they are, in fact, robbing themselves of a valuable opportunity to heal and rejuvenate. In the long run, night owls may find themselves with deep-seated imbalances and ill health. Ayurveda recommends that one wake up before 6 A.M. Since it is ideal not to be startled awake by alarms, the best way to spontaneously get up early—and feel rested— is to go to bed early. The period before 6 A.M. is the time when all of nature is waking up. At this time vata dosha is most lively in the environment. Starting the day during vata time means our mind will experience more of the qualities of balanced vata throughout the day— increased energy, clarity, intelligence and alertness. The longer we sleep past 6 A.M. the more we are asleep while kapha is dominating the environment. If we sleep in until 7:30, for example, we are lying dull and dormant for 1 and 1/2 hours of kapha time and we will wake up imbibed with those same qualities. This simple adjustment in routine can make a huge impact on our health. If you are in need of extra “me” time, better to go to bed on time and wake up an hour earlier in the morning. ( Picture of woman sleeping. Source: Google Advance Image Search. According to Ayurveda, compulsive overeating or binging comes from cravings. An ideal weight loss program addresses imbalances in one’s physiology and in one’s diet that may be at the root of cravings and binge behaviors. Cravings can arise from imbalances in our body or from actual nutritional deficiencies. It is better not to try to suppress cravings, because they will only return with increased intensity. Instead, in order to eliminate cravings we need to learn to identify what our body really wants, and then thoroughly satisfy that need. Ideally the first step in dealing with food cravings or binging would be to consult with an Ayurveda expert (or with your doctor) to make sure that your nutritional needs are being addressed. If you are a vegetarian, are you getting all the necessary amino acids? Vitamin B12? Remember that absorption of B12 can diminish with age. Even if you are eating animal products, if you are over 60 you might want to get your B12 levels checked. If you are not a vegetarian, are you getting enough fruits and vegetables? Keep a log of what you are eating at breakfast, lunch and dinner in order to objectively assess whether or not your diet is balanced and healthy. The third question is, are you getting all 6 tastes (sweet, sour, salty, astringent, pungent and bitter) in your meals? Not only does eating all 6 tastes ensure that all the major food groups and nutrients are represented, it also gives us the feeling of satisfaction. As we eat, our taste buds send messages to our brain letting it know that we have taken in the energy and nutrients that we need. The six tastes are the codes that inform our brain of our meal’s nutritional content. If we take foods that correspond to each of these tastes throughout the day, our meals will provide us with a wide assortment of health-promoting nutrients. If we do not take in the proper nutrients, our brain sends us hunger signals. Notice any physical sensations that come up. Where are they coming from? Do you feel some tension or discomfort? When you feel a sensation, your mind will naturally be drawn to the area of the body that is feeling uncomfortable. This is nature’s way of facilitating the healing process. Because attention by itself has healing power, it brings wholeness to the area. With a few minutes you may find that the discomfort completely subsides. Drink some plain warm water to see if that settles your system. Also, make a habit of drinking water throughout the day. People often mistake thirst for hunger. Schedule a consultation with an Ayurveda expert. 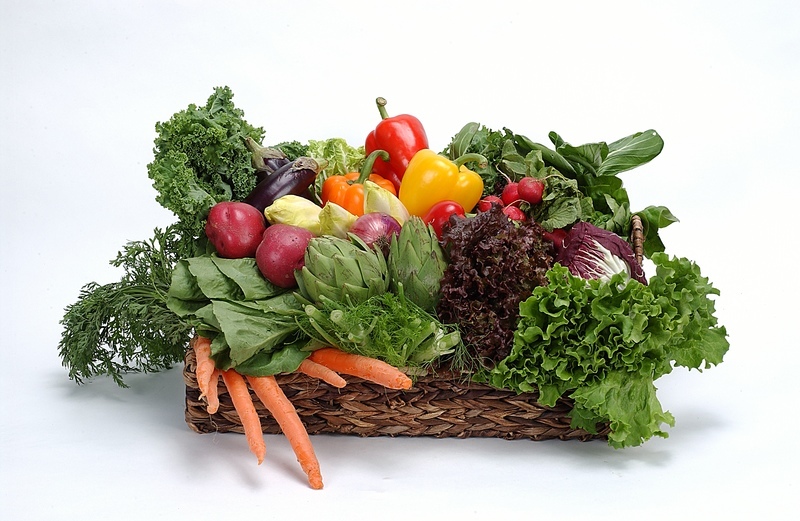 ( Picture of fruits and vegetables in basket. Source: Google Advance Image Search.